Today, we’re going to talk about Paper.li, a free service you can use to setup a custom online newspaper on your topic of choice. With Paper.li, you can automatically find, publish relevant articles, photos and videos from across the web on a daily or weekly basis. And it’s really easy to set up. You can publish your paper via email but what I find valuable is that the service will automatically post a tweet on your Twitter account whenever a new edition is published. If you or your company have a Twitter account but don’t Tweet regularly, this is a great way to keep your account active. This way, when prospects or customers check you out on Twitter, they don’t see that your last Tweet was six weeks ago. Instead, they see relevant daily content. I prefer to see people interact on Twitter but when you don’t have the resources to devote to tweeting regularly or when there are gaps where there just isn’t time to Tweet, paper.li provides a simple solution. You can also embed the content from your paper in a widget on your blog or, you can make the paper the primary content of your blog and you can customize it match your brand. Paper.li lets you choose from a variety of Twitter news feeds for sources for your paper’s content but you can also create your own source list. 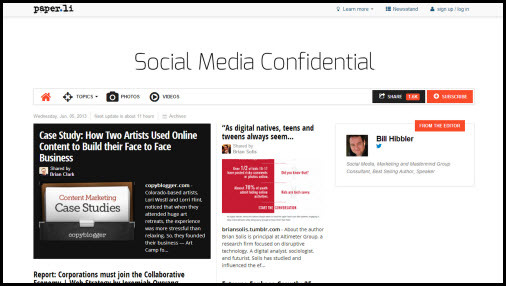 For my paper, Social Media Confidential, I created a list in Twitter of several people I know provide relevant content on a regular basis, including my own Twitter accounts, and selected that list as my news source. An added benefit is that the promotional tweets will often include the Twitter handles of one or two of the contributors.. That way, the contributors will notice you’re promoting their tweets and will often tweet a thank-you and even re-tweet the post. I find that my followers will also re-tweet the posts promoting my newspaper which helps expands my reach. Paper.li’s free version is pretty feature rich but they also offer a pro account for $9 per month that lets you put your paper on your own domain, insert your own ads, use Google analytics and get more editorial control of your content. That’s an awesome video and the team and I are honored to be your tip of the week. We truly appreciate the effort and time you have put into featuring our product and summarizing the service and we must say — Paper.li has never looked better on the big screen! We look forward to some follow-up cameos on your show talking about how you use Paper.li for marketing, to build community and raise awareness around your business. Thanks for stopping by! I’ll definitely re-visit the topic in the future. I’ve been using paper.li for some time and thought I’d it would make a great topic for my new show. Don’t be a stranger! Thanks for sharing my post Jim! There are so many great examples of how the community is using Paper.li. Hard to capture them in a post! You’re welcome Carly! 😉 Seriously, I’m noticing some new converts in my Twitter stream and I’m planning to add a paper.li feed to some of my other Twitter accounts. Those are secondary accounts around particular brands that I don’t post to as often so Paper.li can deliver some targeted content. Kelly, any idea what percentage of users are using their feed as their primary content on their blogs? Apparently I’ve come up with a new nick-name for you Bill! 🙂 Not sure where Jim came from… time for a coffee break!